Sometimes the scariest stories aren’t about ghosts or vampires. Often, the scariest stories are the ones that come directly from real life. Like the story of Carl Tanzler. At the age of twelve he had a dream that his ancestor, Countess Anna Constantia von Cosel, revealed to him the face of the woman he was “destined” to be with. Elena De Hoyos was having the worst time of her life. She had been pregnant, but then suffered a miscarriage. Shortly after the miscarriage, her husband left her and moved away to another city. Then she came down with tuberculosis, a disease of the lungs that was killing people all around her. In desperation, her mother brought her to a local hospital in Key West, Florida in the hopes that some new treatment might save her life. It was there that she met a man named Carl Tanzler. He was strange, no doubt about it. From the moment he laid eyes on Elena he was eerily obsessed, claiming that he had seen her exact face in a dream when he was only twelve years old, before she’d even been born. He had been looking for her ever since. Thinking about every little detail of her face, dreaming about it. This strange man showered Elena with jewelry and clothes, each time claiming that he was madly in love with her. It didn’t matter that he was fifty-six years old and she was only twenty-one. It didn’t matter that they were both already married to other people. Nothing mattered to him, only his obsession that she was his destiny. But Elena had bigger things to worry about: trying to survive tuberculosis. She definitely did not feel that Carl Tanzler was her destiny. Yes, the gifts were flattering, but what kept her talking to him were the promises he made about her health. He said that that he was an experienced submarine captain. He claimed that he had nine university degrees. He said that he knew the medical procedures that would to cure her tuberculosis, and that he could build the machines needed to do them. He gave her numerous medicines, took x-rays, and showed up with all kinds of so-called medical equipment. Turns out that he didn’t have the knowledge to cure her of tuberculosis after all. Despite all the “treatments”, she died at her parent’s home about a year after meeting him. But for Carl Tanzler, this was not the end of the story. 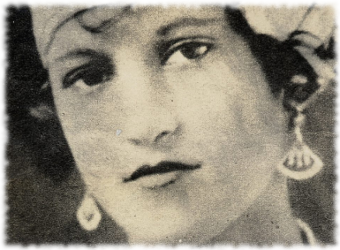 Elena’s parents were moved by Carl Tanzler’s efforts to save their daughter. Yes, he was creepy, but at the same time he had done more than even Elena’s own husband ever did to try and save her. So when he offered to pay for her funeral and to have an above ground tomb be built for her, her parents agreed. And when he asked for some of her hair, they again agreed. 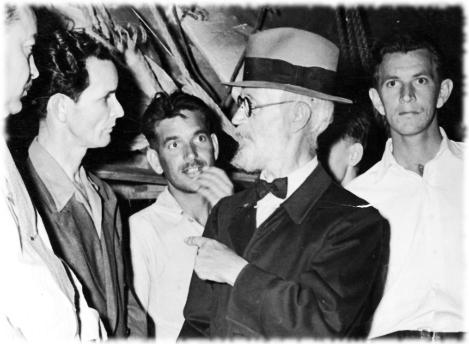 After the tomb was finished Carl Tanzler was seen visiting it every night. Everyone thought it was sweet how he clung to her, but no one knew that he was the only one who had the key. No one knew he had a phone installed inside the tomb. No one knew that he was secretly …preserving… her. 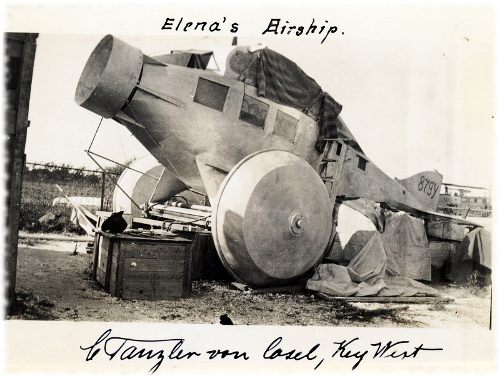 And no one knew that one quiet night, Carl Tanzler gathered up the corpse of Elena De Hoyos and put her in a red toy wagon. He then dragged the wagon all the way back to the hospital, where he had set up a special place for “Elena”. Well, it wasn’t exactly IN the hospital. You see, behind the hospital there sat the wingless body of an old airplane. 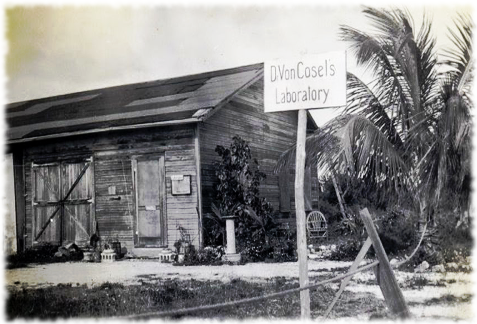 It was here that Carl Tanzler set up his laboratory. He spent many days reconstructing “Elena” using wires, coat hangers, and plaster. Glass eyes now stared up at the ceiling of the plane. Then he dressed the new “Elena” in a wedding ress and put her back in the red wagon, this time taking her to his house. And there she stayed for almost a decade. At night he would lay her in his bed and sleep next to her. 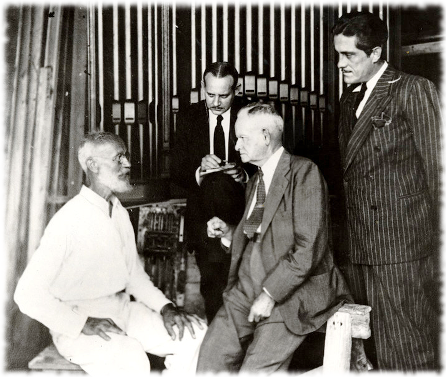 During the day he would set her up in a chair and play love songs for her on a small organ he had made. Or, sometimes, he would just talk endlessly to “her”. But the hot and humid Florida summers began to take their toll on the corpse. 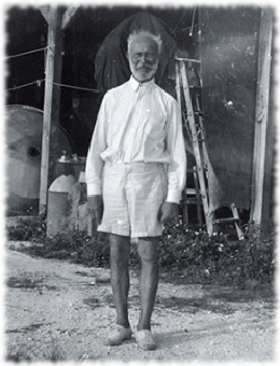 Carl Tanzler had created his own little world inside his house, but reality kept intruding. He desperately poured disinfectant and perfume all over the place. And as her skin decomposed, he used silk cloth drenched in wax and plaster to replace it. When her hair fell out, he made a wig from the hair he had asked her family for, and glued it onto her skull. You see, Carl Tanzler liked to imagine that he was a scientific genius that was destined for greatness. Even though he had failed to save Elena from tuberculosis, he now convinced himself that he could reclaim her from death itself. Even when faced with a rapidly rotting corpse lying in his bed, he clung to his fantasy world. The plane, he told himself, was the answer. He would rebuild the plane and take the corpse up into “the stratosphere so radiation could penetrate her tissues and restore her to life.” Someday. But that day never came, people were starting to get suspicious. Over the years rumors had circulated. At first the family of Elena De Hoyos had brushed them off. Yes, Carl Tanzler was a little creepy, but in the end he turned out to be a sweet old man who had fallen in love with their Elena and tried to save her life. …right? 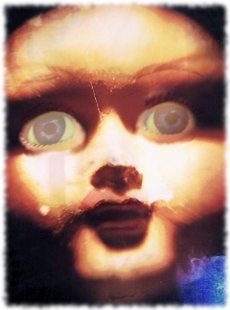 But then one day a boy who was walking by Carl Tanzler’s house happened to glance in the window at just the right time. 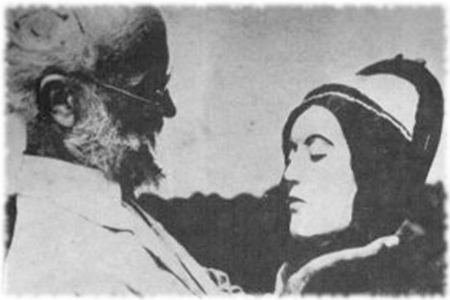 He saw Carl Tanzler dancing with what appeared to be a life-sized doll which had an eerie resemblance to Elena De Hoyos. News got back to the family. 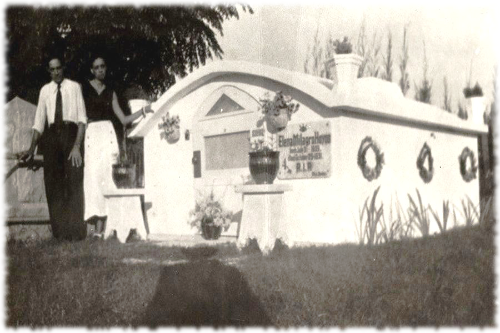 Come to think of it, they said to each other, no one had seen Carl Tanzler at Elena’s tomb in many years. Elena’s sister gathered up her courage and confronted him about the rumors. She made him go to Elena’s tomb and demanded that he open the door. When Elena’s sister went to Carl Tanzler’s house she was overwhelmed by the smells. As she approached the bedroom, she saw, to her horror, a figure through the curtains on his bed. She took slow steps forward. The closer she got, the more she could see that the figure looked like her dead sister. She rushed out and brought the police back to the house. When they opened the door they saw Elena sitting there. Carl Tanzler had dressed her in a Kimono and propped her up in a chair. In her hand was a single rose. The situation soon became famous in the area. There was much media attention, and a trial. 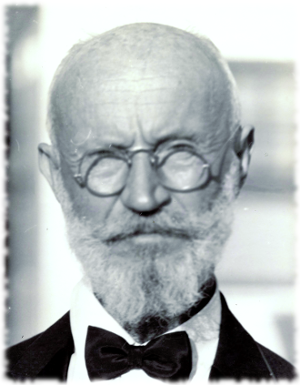 Carl Tanzler was examined by a psychiatrist and deemed mentally competent to stand trial. He was charged with destroying a grave site and graverobbing. But the courts discovered that too much time had passed since he had stolen Elena’s corpse and the charges had to be dropped. The public’s reaction to this? People were generally happy that Carl Tanzler had been set free. Instead of a creepy graverobber, most people saw him as a romantic old man who was so madly in love he was willing to sleep in the same bed as a corpse. After the trial was cut short, Elena’s body was put on display at a local funeral home for everyone to come by and gawk at. They then re-buried her in a steel box at a secret location. 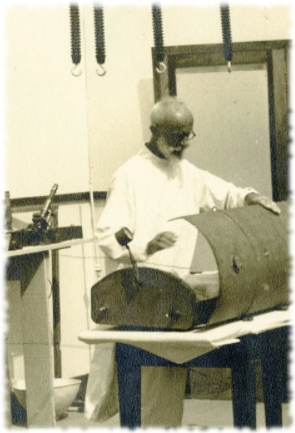 As for Carl Tanzler, he gave tours of his “laboratory” in exchange for money. And when the money stopped coming in he decided it was time for a change of scenery. He then went to Elena’s tomb, blew it up, and proceeded to move to a new town. And that was the end of it…right? Not for him. 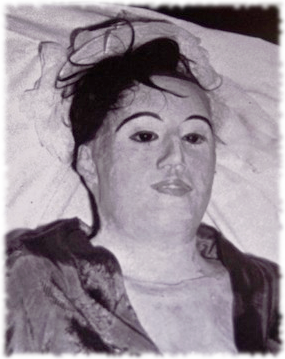 When Carl Tanzler died many years later, his body was found on the floor next to a life-sized replica of Elena’s body. 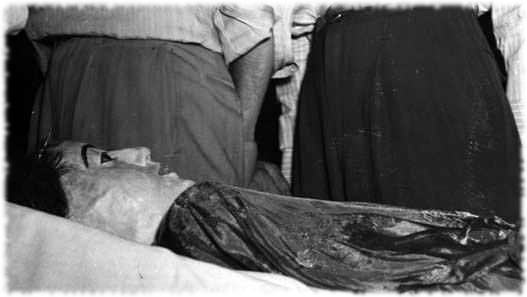 Now this was freaky enough on it’s own, but when investigators looked more closely, they saw that the face on the body was eerily lifelike. Turns out he had made a death mask from the face of Elena’s corpse, and had used this mask as a starting point to build a new “Elena”. He had lived and obsessed over this new “Elena” and her face until his death. So in his own twisted way, Carl Tanzler had made the dream he’d had as a twelve year old come true. The face his ancestor had revealed to him, through his extreme obsession, had become his destiny after all. Walking home alone can be freaking scary. From Slender Man to Kuchisake Onna, it seems like there are all manner of evil beings that will stalk your footsteps on your way home. Especially if the sun is starting to go down. A boy was walking home from school, alone. He usually walked home with a friend, but his friend had been mysteriously absent from class that day. At first the boy told himself that walking alone was no big deal. But as evening began to fall he couldn’t help but notice all the dark shadows between the street lights. Usually he saw at least a couple of other school kids on their way home or an adult walking their dog or something. He scanned the area as he walked, nothing. But then again it was starting to get a bit misty out as night was approaching, so maybe people were staying inside. Maybe? Suddenly a movement caught his attention, it was very slight but enough to make him turn and look. Near him was an old brick building with one of the windows on the second floor open. Looking out of the window was a girl. Her elbows were resting on the windowsill and she had her head in her hands, gazing out as if in a daze. The boy held his breath, this was the most beautiful girl he had ever seen. And to see her there in the midst of such a gloomy walk home, that felt magical to him. He walked across the grass towards the building. He wanted to get closer and see her more clearly. However, things did not go as he planned. As he approached the building his foot brushed against an empty potato chip bag lying in the grass. At the sound of this the girl snapped out of her daze and her eyes whipped towards him. She glared at him so hard that he stumbled backwards. The girl put her hands on the windowsill and raised herself up. It was then that the boy saw the most horrifying thing he’d ever seen in his life, the bottom part of her body was gone. Like it had been chopped off. But then… how could she even be alive? The boy stumbled backwards for a few more steps and then began to run, dropping his backpack. Behind him he could hear the girl jump down from the window and make scraping sounds as she rapidly came towards him. In the last remaining moments of his life he looked back over his shoulder to see how close she was. Gazing up at him was a twisted and mangled face with teeth clenched in anger. Her shirt was covered in blood and she was using her nails to drag her torso along the road. The last thing he saw was one of her bloody hands reaching out towards him. This is just one of many tales out there about people being attacked by Teke Teke. But who is this she exactly and where did she come from? Urban legend tells us that it all began with a girl from Japan named Kashima Reiko. She was a girl who was shy and timid at school, never really quite fitting in. Over the years she became the target of constant bullying by the other kids in her class. In Japan they have many high speed trains that help everyone get around, and Kashima Reiko took one of these trains home from school each day. On one drizzly day as she was waiting on the train platform some other kids behind her decided to play a trick. They pretended to be walking innocently by, then a girl pushed Kashima Reiko towards the edge of the platform as a train was approaching. The idea was to scare Kashima Reiko and make her cry, but not actually push her too far towards the train. However, things went very wrong. The girl pushed Kashima Reiko too hard, and with the platform being so slippery Kashima Reiko fell right into the path of the high speed train. As the train passed, her body became split in half. This was the day Kashima Reiko became the creature known as Teke Teke. And why do they call her Teke Teke? The name comes from the scraping sound that you hear when she is coming to get you. Teke Teke is a huge urban legend in Japan and many people believe that she stalks people walking along roads, especially the areas around train tracks. She is looking for anybody who even slightly resembles the kids who bullied her. Sometimes, like Kuchisake Onna, she will ask you a trick question where you will have a chance to save your life if you know the right answer. But often she simply attacks and will even cut the victim in half to get revenge for her own gruesome death.